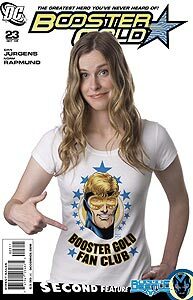 Cover Description: Blair Butler wears a t-shirt promoting the Booster Gold Fan Club. This is the first cover of a comic book containing the adventures of Booster Gold to feature a photograph instead of a drawing. This cover qualifies as a product placement, as the t-shirt worn by Ms. Butler is licensed for sale by DC Comics through Graphitti Designs. Brief Synopsis: Booster Gold and company must travel into the future to learn more about the plans of the nefarious Black Beetle. ALTERNATE REALITY: Booster Gold and Skeets II discuss their recent failure while surrounded by the fallen Teen Titans Changeling, Cyborg, Kid Flash, Robin, and Wonder Girl. This panel is nearly identical to the vision that Raven showed the defeated Ravager in The New Teen Titans, Vol. 1, #2. Rip Hunter arrives in time to save Booster from an uncomfortable conversation with Raven. At this point in Teen Titans' chronology, Raven had been recently instrumental in the revitalization of the team. 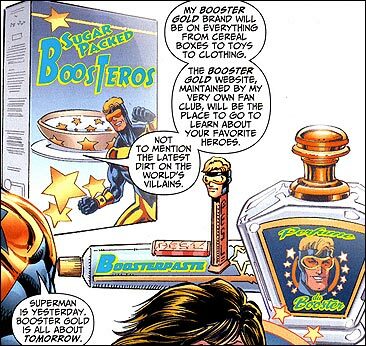 PRODUCT PLACEMENT: In telling his much abridged origin to Raven, Booster reveals that his "Booster Gold brand will be on everything from cereal boxes to toys to clothes." Products shown include Sugar Packed Boosteros, Boosterpaste toothpaste, Perfume du Booster, and a Booster Gold-shaped PESL candy and dispenser (clearly a competitor to PEZ candies). Cover model G4TV reporter Blair Butler is shown in a Booster Gold Fan Club t-shirt, presumably the webmaster of Booster Gold's website, maintained by his "very own fan club." PESL SIGHTING: A "PESL" candy dispenser? Why does that name sound so familiar? Booster Gold, Raven, Rip Hunter, and Skeets arrive in the New York City borough of Manhattan in a post-apocalyptic 2020. Clearly visible in this and future panels are the ruins of the Chrysler Building and Radio City Music Hall. Skeets reveals that as a result of Black Beetle's interference in the events of recorded history, the Earth has fallen under the control of the other-dimensional demon Trigon the Terrible. Trigon debuted in the same issue that originally featured the events that were the focus of Black Beetle's scheme, The New Teen Titans, Vol. 1, #2. Skeets projects an "historical" image of the Justice League defeated by Trigon and the Black Beetle. Leaguers shown are Aquaman, Black Canary II, Black Lightning. Flash II, Green Lantern II, Hawkman, Superman, Wonder Woman. The Time Masters have little difficulty in overcoming the anti-Trigon resistance fighters Kyle Rayner and Zatanna. It seems that alternate history is repeating itself: this entire story is becoming more and more similar to the relatively recent events of Booster Gold, Vol. 2, #6 through #10, wherein Black Beetle orchestrated the alteration of recorded history in order to create an apocalyptic future where freedom fighters comprised of former Justice Leaguers would battle the forces of a villain who should have already been defeated. (The foe of the earlier story was Maxwell Lord, and his plans were originally foiled in the 2005 Infinite Crisis mini-series. In this case the villain is Trigon and the altered events were originally seen in 1980's The New Teen Titans, Vol. 1, #1 through #6. Boosterrific Review: Unfortunately, this issue salvages little of the exciting momentum of the previous issue as it soon devolves into a plodding story filled with extended exposition and a series of seemingly pointless surprise revelations without any significant action, character development, or plot advancement. It is hard to tell if this issue is truly bad, or just suffers by comparison to the cheerfully nostalgic enjoyment of the previous issue, though it likely is a little of both. This issue is slow, even when one recognizes that it is a transitional issue. The scene where Booster spins his future to Raven is funny but can only redeem so much of the story. And guess what? It's the Black Beetle. Again.